Many know the traditional way of employee time tracking: signing when entering and leaving work. But this is only a superficial way of defining time tracking since it entails much more. In addition, there are several ways to carry out this registration. Let’s go over what employee time and attendance tracking is and what it means. What does ‘time and attendance tracking’ mean? Time tracking, also called attendance tracking, in a company is the action of counting the hours that each one of its employees has worked, and how they have been distributed throughout their day. This includes the hours between entry and exit from the workplace, as well as overtime and hours that have not been completed, for whatever reason. Although the concept of time tracking sounds like the signing we know, it does not mean that the way you make it happen shouldn’t be modernized. Previously, when a worker signed upon entering and leaving their job, he signed it manually using good ol’ paper and pen. Although there are companies that still do so, this system adds an overload of work that is not necessary at all. Imagine all the paperwork and extra documents if we are talking about a somewhat large company, with a somewhat extensive staff. On top of that, imagine the number of subsequent reports and the task of organizing the protocols of this time tracking. Nowadays, there are many devices and automatic registration systems available to update the information simultaneously and at the same time as the employee indicates their arrival or departure. We have talked about systems such as software for management of work schedules, applications for computers and even mobile phones, fingerprint detection, personal and non-transferable codes, biometrics or RFID proximity systems through PVC cards, key rings or wristbands. Using these technologies, the company can better manage the time of their employees without having to spend more hours in the process. In addition to this, many of the management systems that allow you to keep track of time offer other services such as payroll management programs or the ability to solve incidents more quickly. Basically, it is the best way to improve the human resources department, because every employer has the objective of optimizing the time spent in processes such as payroll management. What is the time tracking and signing for? Time tracking is exactly what it sounds like: to track the hours worked by each employee. This is beneficial for both the employee and the company. With time tracking, the employee can be sure they are not working overtime that will not be remunerated, and the company can control the problem of work absenteeism and save time managing schedules, keeping up with dates, among other things. With a time and attendance system, the employee must sign in all of their exits and entries, even those that occur during mandatory breaks. This is especially useful to see the hours that the employee really spends working and developing their tasks, with the objective of measuring productivity and making decisions such as increasing or reducing the staff necessary for the development of specific projects. Time tracking also serves as a payroll and salary management tool, as it is such an important source of information. With this system, you can improve the organization of a company and, at the same time, improve the productivity of your office. In addition to all the benefits that we have already discussed, implementing time and attendance tracking in a company would mean being able to know which employee is at their position at what time. This is useful, for example, if an emergency situation occurs. 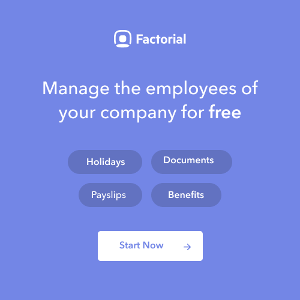 You can also make flexible schedules easier, as well as manage shifts by just taking a look at the page that includes the schedules of all workers, and this is especially useful if your company has a high staff turnover. Finally, it is also a good way to have a count of the hours that the company owes to the employee, or those that the employee owes to the company. In many places around the world, including in Spain, time tracking and signing are mandatory for companies and employees alike. The biggest disadvantage is the rejection that the employee may feel in the face of this control measure, by thinking that there’s more surveillance during their working hours. If this change is made in your company, you must ensure that the way you communicate it internally is the correct one, always emphasizing the benefits that this system has for employees. If you do not communicate it properly, your employees may lose their trust in you and also their motivation to perform.